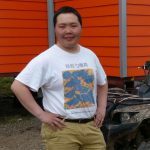 This is Slava’s second year in Chukotka helping with the spoon-billed sandpiper project. Between these years, in 2015, at Northeastern Federal University in Yakutsk he defended his undergraduate thesis, entitled “The Biology of the Reproduction and Development of the Ringed Plover in the eastern part of its Range”. He is now a lab assistant at the Institute for Biological Problems of the Permafrost Zone of the Siberian Department of the Russian Academy of Sciences. He is again studying the Ringed Plover breeding population in Meinypil’gyno and assisting both field and avicultural teems when needed.